Had a good pool workout tonight with East Coast Freedivers group training at the Walter Brown Arena in Boston. Went into the night not expecting much since I have felt a little off my game for the last month because of various stress factors. The night started off with FRC (functional residual capacity) dives down to a brick in the deep end of the pool. Diving after a passive exhale (FRC) is a good warm up before deep ocean dives, and is excellent training for freedivers restricted to a pool during the winter, as it simulates greater depth in terms of lung volume. Since this is an O2 workout and not as active as other workouts it is easy to get cold. Once you get cold your breath-hold time is significantly reduced, so a wetsuit in the pool is recommended. 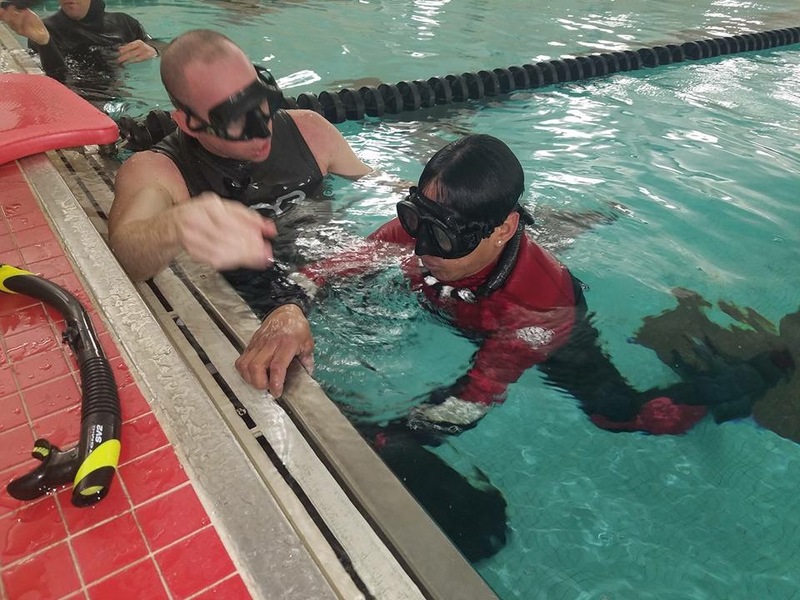 Divers were paired up in teams of two for direct supervision on all the dives as this workout can push limits, and we want a safety diver right there in case of LMC or blackout. After fifteen minutes of the diver teams switching off on FRC dives, we moved on to active full lung dives from the shallow end, 25 yards. down to the brick, and then back to the shallow end for a half hour. All of these active dives were done with direct supervision. A safety diver on the surface with a kickboard watches the submerged diver at all times during the dynamic dive, and proper recovery breathing was executed after every dive. I actually surprised myself with a nice 2:00 FRC dive on the brick, and a really nice comfortable 2:30 active dive. Close to my best FRC dive and one of the best active dives I have done in the past year. It’s nice to see the workouts paying off, and my skills slowly returning. I only feel this way sometimes when working out in my gym and see effect when taking my supplements (those are no secret, those who are thinking about taking supplements should click over here now). Thanks to my training partner Jose Sanchez (in the red trimmed wetsuit) for watching over me while I pushed my times. Remember this workout requires direct supervision. If you are local to Boston and are looking for freedivers to train with, East Coast Divers runs weekly group freedive pool trainings. Call the shop, message me, or join the Facebook group East Coast Freedivers to find out the schedule and info on trainings. If you try the workout with your group let me know how it went, and if you have a variation that you tried, leave a comment. Dive safe.